At a time of flux and upheaval in the higher education sector there is a need to be able to understand how institutions are responding to a changed environment. There may be a particular need to understand how networked services are being used which may have previously been regarded, in some areas, as inappropriate for institutional use. This is particularly true of Facebook which has been the subject of criticism for being a ‘walled-garden‘ and for what may be regarded as a cavalier approach to privacy. But are institutions now making significant use of Facebook because of the benefits it is perceived to bring, such as the large ability to provide marketing to large numbers of users and the ability to embed other services within an environment which many users may be familiar with? Anecdotally we are hearing suggestions of the benefits which Facebook can provide, such as the recent tweet from Stuart Brown which stated that “10 course registrations attributable to OU FB apps Course Profiles and My OU Story“. In order to provide a better understanding of how UK higher education institutions may be using Facebook a brief survey of official usage by Russell Group Universities has been carried out. The aim is to ensure that evidence is available to inform discussions on policies and practices. A recent post summarised “Institutional Use of Twitter by Russell Group Universities“. The twenty Russell Group Universities have also been used for a survey of institutional use of Facebook. There have been suggestions that a more comprehensive survey across all UK Universities would be useful. Whilst this may be true it would be resource-intensive to carry out such a survey. The Russell Group Universities has therefore been selected partly because of the geographical diversity of these institutions, which includes institutions based in England, Northern Ireland, Scotland and Wales. In addition since these institutions describe themselves as “the 20 leading UK universities which are committed to maintaining the very best research, an outstanding teaching and learning experience and unrivalled links with business and the public sector” we might expect the institutions tom be taking a leading role in exploiting social media to support their activities and provide examples of best practices which the wider community can learn from. The survey of institutional Facebook usage by Russell Group Universities was carried out on 11 January 2011. The survey used Google to find an official institutional Facebook presence. Note in a number of cases no obvious institutional Facebook page could be found (note that Facebook pages for departments were not included). A summary of the numbers of Facebook users who ‘liked’ the institution’s page is given, together with the numbers of ‘favourite pages’ the institution provides. A list of additional pages available via the tabbed interface is also provided. NOTE Appears full of spam. No official institutional page found. A University of Leeds Latest Update application is available but this does not seem to be being used. The popularity of Facebook usage at the Universities of Oxford and Cambridge has been confirmed by a recent post on “Top 10 of Social Media in HE” published by the Science Guide blog. The Science Guide survey “conducted research and created a Top 10 list of [European] HE of the best in social media and presents three prestigious universities that lose out in the race for Twitter, Facebook and co“. UK universities are by far outperforming other countries in communicating via social media. More than 60% of all university twitter followers are connected to UK institutions. They also account for 42,4% of all Facebook members. In addition the “institutions that are widely regarded as elite and prestigious in Europe … are ranked highest in quality of research, but … still have to find their way into the 21st century” due to very limited or no use of Social Web service did not include any UK Universities. Such comments suggest that UK Universities should be pleased with ways in which Social Web services are being integrated into existing services. But what additional observations can be made from the survey results published in this blog? How important might Facebook be to institutions? I heard that at the recent Learning Without Frontiers conference it was suggested that Facebook users find the management capabilities of Facebook valuable as it makes it more difficult for content, such as embarrassing comments and photos, to escape into the wild. Perhaps the ‘walled garden’ nature of Facebook is being regarded as a positive aspect of the service. But is Facebook something which is only useful as a marketing tool to attract new students or might it have a more significant role to play? And rather than a one-way marketing channel might it have a role to play in facilitating discussions and debate and, if so, might Facebook prove useful for internal discussions as well as engaging with new students? I suspect the answers to such questions will be answered by observing patterns of usage, with, despite Facebook’s growth, the service is not liked by many who engage in actively discussions on blogs. But looking at evidence of evidence of how Facebook is being used, rather than speculating on the relevance of Diaspora “privacy aware, personally controlled, do-it-all, open source social network” I feel it is worth looking at the approaches being taken by Cambridge University, with its page on “House Rules” and Cardiff University, who, from the information provided on their Facebook page appear to be positive about the benefits the service can provide. Is it realistic to argue against the popularity of Facebook (142,176,215 unique visitors according to compete.com) and for institutions, at a time of cuts, to promote alternatives? Or should we be making use of the service to support a variety of institutional activities? If you feel the latter is a decision we need to make (and many of the Russell Group Universities already have) then in order to ensure Facebook is being used effectively there is a need to share emerging best practices. Wouldn’t you agree? This entry was posted on 18 Jan 2011 at 11:46 am	and is filed under Evidence, Facebook. You can follow any responses to this entry through the RSS 2.0 feed. You can leave a response, or trackback from your own site. Students are much more likely to have a “social engagement” with their department or school, rather than the institution as a whole. So I would look for different evidence of social networking in HE. I agree with that point by Les, especially for very large universities. 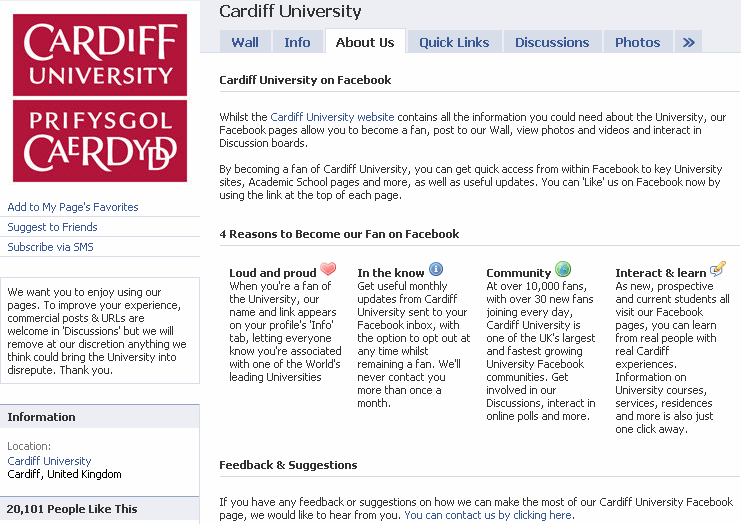 See http://www.facebook.com/home.php?#!/uoebusiness for more effective use of FB at the school level. Thanks Les and Simon for your comments. If for large institutions such as Southampton and Edinburgh it would be more appropriate for individual departments or schools to provide their own Facebook presence then I guess it will be even more important to document best practices, to avoid, for examples, departmental Facebook pages becoming out-of-date and attracting spam posts. Thanks Helen – have added a note to the table above.